We’d love your help. Let us know what’s wrong with this preview of Never Be Sick Again by Raymond Francis. One day Raymond Francis, a chemist and a graduate of MIT, found himself in a hospital, battling for his life. The diagnosis: acute chemical hepatitis, chronic fatigue, multiple chemical sensitivities, and several autoimmune syndromes, causing him to suffer fatigue, dizziness, impaired memory, heart palpitations, diarrhea, numbness, seizures and numerous other ailments. Kno One day Raymond Francis, a chemist and a graduate of MIT, found himself in a hospital, battling for his life. The diagnosis: acute chemical hepatitis, chronic fatigue, multiple chemical sensitivities, and several autoimmune syndromes, causing him to suffer fatigue, dizziness, impaired memory, heart palpitations, diarrhea, numbness, seizures and numerous other ailments. Knowing death was imminent unless he took action, Francis decided to research solutions for his disease himself. His findings and eventual recovery led him to conclude that almost all disease can be both prevented and reversed. 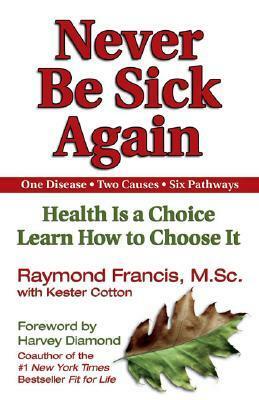 In Never Be Sick Again, Francis presents a seminal work based on these findings — a revolutionary theory of health and disease: there is only one disease (malfunctioning cells), only two causes of disease (deficiency and toxicity), and six pathways to health and disease (nutrition, toxins, psychological, physical, genetic, and medical). This remarkable book answers the questions: What is health? What is disease? Why do people get sick? How can disease be prevented? How can it be reversed? It will teach readers, in one easy lesson, an entirely new way to look at health and disease — an approach that is easy to understand, yet so powerful that they may, indeed, never have to be sick again. To ask other readers questions about Never Be Sick Again, please sign up. what good food for diabetes? I have to say that, compared to most Americans, I lead a fairly healthy lifestyle. I cook almost everything my family consumes from scratch. We rarely dine out (except for a weekly foray to a local Lebanese restaurant where we can find inexpensive entrees made from fresh vegetables and lentils.) I drink unsweetened tea and water. I do not purchase food that comes in boxes. I do not purchase pre-prepared foods except for the occasional emergency carry out at a health food store. I take a daily su I have to say that, compared to most Americans, I lead a fairly healthy lifestyle. I cook almost everything my family consumes from scratch. We rarely dine out (except for a weekly foray to a local Lebanese restaurant where we can find inexpensive entrees made from fresh vegetables and lentils.) I drink unsweetened tea and water. I do not purchase food that comes in boxes. I do not purchase pre-prepared foods except for the occasional emergency carry out at a health food store. I take a daily supplement. I try to walk 4 or 5 days a week. We are blessed to have health insurance, so I can schedule a yearly exam and see a doctor if I feel I need one. But after reading this book...(especially right in the midst of my annual holiday binge where I go off my low sugar diet for a few weeks to enjoy baking traditions)...I feel like I have just stumbled out of a Lost Weekend with Hunter S. Thompson and Mickey Rourke. Because this book basically says that our entire environment is toxic. And that habits we have formed in this society since our earliest childhood are going to kill us. It is a frightening book. Raymond Francis is not a doctor. He was trained as a chemist and went to MIT. He had a very successful career and lived a standard affluent American lifestyle. Things fell apart for him at age 47 when his health began to fail. He suffered across-the-board physical breakdown, chronic exhaustion, allergies, muscle aches and multiple chemical sensitivities. Francis' physician blamed most of these issues on 'aging'. Francis was told to take a vacation. It did not help. After deciding to see an allergist, Francis's fate appeared to be sealed. The allergist administered a diagnostic test called an intradermal test--injecting an allergen into the skin. This is a much more risky test than the typical scratch tests. This procedure is known to cause injury and even death in some patients. In Francis' case, the result was a disaster. His immune system became completely compromised. In the next year, Francis would suffer a multitude of autoimmune syndromes, including thyroiditis and lupus. He visited 36 medical doctors in that time period. Finally Raymond Francis encountered the doctor who would nearly kill him. This doctor prescribed an antiparasitic drug called metronidazaole, which turned out to be toxic to Francis' liver. Francis suffered a severe reaction to this drug and his liver failed. He was deathly ill, emaciated at 120 pounds, bed ridden and his doctors doubted that he would survive. Although Raymond Francis was physically devastated, a part of him wanted to fight for his health. He was inspired by Norman Cousin's "Anatomy of an Illness" -- the book where Cousins describes his own fight against a deadly illness. If Cousins, a layman with no medical or scientific background, could fight for his life and win, why couldn't Raymond Francis, a trained chemist, do the same? Thus the author went on to fight for his health. He did so by paring the concept of illness down to elemental building blocks of our bodies, our cells. According to Francis, all disease is caused either by a deficiency in our cells (they are not getting vital nutrition they need) or toxins (the cells are compromised by a polluted environment). I am giving this book 5 stars because I honestly believe everyone in America should be getting much of this information. We put things in our mouths and feed things to our kids that compare to going into a chem lab or a land fill and ingesting those poisons. Many people are thoroughly misinformed about what is healthy and and what is not. The mainstream health system does little to clear up this confusion; and often adds to it. I have seen the results of correct eating up close. My husband and I cleaned up our act about 7 years ago and we live the positive results daily. I feel we are on the right track, nutrition wise, and I picked up some more information I can apply to further reduce our intake of toxins. In other areas, I have further to go. I purchase and use standard issue toiletries and cosmetics and I am starting to rethink this. I am concerned about out drinking water. I wonder if I should get certain tests now when they are prescribed to me at the doctor's office. I have been on birth control pills for years and years and I now wonder what I am doing to my body. من قال أن علم الإقتصاد علم كئيب.. يكذب أو أنه لا يعلم الطب ولم يقرأ فيه، كتب الطب مليئة بالتحذيرات التي لا ننكر أنها مفيدة لكن لا أظننا سوف نطبقها بدقة، هذا الكتاب يحذرك من كل شيء من الماء الذي بالنهر الذي بجانب بيتك لأنه قد تلوث من الثروة الصناعية مرورًا بنسف كل فوائد اللبن وحتى العقاقير الطبية. لكن اتفقت كل كتب الصحة على أمر واحد وهو خطورة السكر والدقيق الأبيض والدهون الصناعية. I didn't finish this book. It had alot of things that truly made sense but if you live the way this guy suggest you would literally have to live in a remote jungle or mountain region away from EVERYTHING. I am not exaggerating. Lots of good information but very very extreme. I'm just not convinced yet. This man was very sick and conventional medicine could not help him. Through avoiding toxins and improving his diet he did become better. His advice is just so radical, I don't see how people can implement it all. When I read it I was so overwhelmed with all the dangers in food and the environment; and his advice on what to do that I was tempted to just give up on changing anything. I almost wish he had a baby step version of his book. I do agree that we need to be be I'm just not convinced yet. This man was very sick and conventional medicine could not help him. Through avoiding toxins and improving his diet he did become better. His advice is just so radical, I don't see how people can implement it all. When I read it I was so overwhelmed with all the dangers in food and the environment; and his advice on what to do that I was tempted to just give up on changing anything. I almost wish he had a baby step version of his book. I do agree that we need to be better informed about the dangers in our food and environment and try to avoid what we can. However, I'm not ready to give up milk, wheat and tap water just yet. I wish he fleshed out his arguments on why milk and wheat were bad. There were just a few pages stating they were bad, stay away. That's not enough to convince me to give up something integral to our diet. His views on modern medicine were intriguing. He states that all illness is caused by cellular malfunction stemming from deficiency or toxicity. He gives six pathways to get better: nutrition, toxin, psychological, physical, genetic, medical. I wonder what would happen in doctors adopted his ideas and tried to treat causes not symptoms. The elusive Fountain of Youth preoccupies the minds of our population in this Dr. Oz inspired media delusion. Whole Grains or Low Carbs? High protein or Vegetarian? How can one determine the path to blissful health with the plethora of contradicting science-supported nutritional plans? Never Be Sick Again by Raymond Francis seeks to demystify the path to wellness through its information overloaded pages. His approach to healing employs the use of a pyramid as a graphic explanation. This pyramid i The elusive Fountain of Youth preoccupies the minds of our population in this Dr. Oz inspired media delusion. Whole Grains or Low Carbs? High protein or Vegetarian? How can one determine the path to blissful health with the plethora of contradicting science-supported nutritional plans? Never Be Sick Again by Raymond Francis seeks to demystify the path to wellness through its information overloaded pages. His approach to healing employs the use of a pyramid as a graphic explanation. This pyramid illustrates the following information. One cause of sickness: unruly cells. Two problems: toxicity or deficiency. Six methods to heal: superior nutrition, minimization of toxins, psychological well-being, physical exercise/management, genetic manipulations, and medical remedies. Some studies are cited. Personal experience is too heavily emphasized. Most of his recommendations are merely speculation. A few do have merit, but they are better explained elsewhere. Being well-read in nutrition and health, I still learned a few tips to integrate into my life. One could not practically apply all of his suggestions to enhance wellbeing. Even I felt overwhelmed by the seeming toxicity of my own life according to Francis, and I am an educated wellness consultant, local food advocate, and holistic adherent. At times the simplicity of the applications of the principles in the book are quite arrogant and ignorant. The promises are of epic proportions. Also the book spent lots of time on what to avoid and in comparison little time on what to seek. A large amount of solutions were directions towards the author's website. However, the fundamental ideas in the book have given me a solid foundation to place my intuition upon and will largely impact my life through giving me a new perspective on health. Th At times the simplicity of the applications of the principles in the book are quite arrogant and ignorant. The promises are of epic proportions. Also the book spent lots of time on what to avoid and in comparison little time on what to seek. A large amount of solutions were directions towards the author's website. However, the fundamental ideas in the book have given me a solid foundation to place my intuition upon and will largely impact my life through giving me a new perspective on health. The model of all disease stemming from cellular malfunction due to toxicity or malnourishment fits perfectly with my attention to the rules of low level interactions in bottom up systems as a solution to higher order manifestations. Human life is an emerging system of lower level life forms, I.e. Tissues and cells. Attention paid to the cells is reflected in all higher levels. Many would tell you that, and I'm one of them. I'm not striving to seem more unique than others in my review; I just want to give this book -this great man- justice. Raymond had suffered from a fatal illness some twenty years ago, and he was on his death bed, but he came back to full health (real one this time). It wasn't some miraclous recovery or some miracle cure; it was simply a lifestyle. A few changes here and there took him out of bed and back on his feet with a ne This book changed my life. It wasn't some miraclous recovery or some miracle cure; it was simply a lifestyle. A few changes here and there took him out of bed and back on his feet with a new purpose: educating people like he educated himself (to put it in his own words). I don't expect you to agree with all the content of this book, and he can't also expect everyone to support him fully. His aim from this book is to convince the largest number of people that just A FEW changes in there diets and lives can mean the difference between life and death. I was so hoping this book had something new to say, but other than listing "6 pathways to health" and emphasizing that each consumer is responsible to for their own health rather than depending on the medical profession, there was litte new information to be had. Also I bought it as a Kindle book and I don't think that's the way to go with informational books; it was too hard to skim and skip as I like to do with such topics. The writing style was a bit pompous and heavy-handed and I had to read I was so hoping this book had something new to say, but other than listing "6 pathways to health" and emphasizing that each consumer is responsible to for their own health rather than depending on the medical profession, there was litte new information to be had. This book is truly one of those eye-opening and life changing books. It's hard to get through at times because of so much information, but if you truly break down and analyze every section, it will be a book worth reading. I'd recommend this book to anyone serious about taking charge of their health. Truly a must read. This book has forever changed my view of health and disease. It's an absolutely essential read for everyone. Period. great writer! Makes you realize lots of things related to your health. Zatial najlepsia kniha o zdravi. Odporucam, kto chce zacat s napravou svojho zdravia. well, i’m gonna cheat and post my reply before i’m all the way through this book. but i’m finished with the last pathway, and so i only have the conclusion left. anyway, this book was definately an eye opener. i’m not really much into self help books, and i’m very skeptical of them, including this one. but, i have been sick a lot the last couple of years, so i thought i’d read it with an open mind and try out some of the suggestions. there is so much information it’s hard to process and remember everything. but the book was easy to read, accessible and not too technical or detailed. i found that it was easy reading, but it dragged and took me a long time to finish. however, right now i’m on vacation and decided it would be too hard to stick to all these restrictions, so i am not doing the things i should. i even ate brownies and ice cream one night, and found that it wasnt all that exciting--i still like it, but it isnt something i cant live without. plus, i still eat chocolate (organic dark chocolate--which is amazing anyway, so i dont feel that bad since i’m not giving up chocolate.) anyway, i like reading about all the pathways, but i dont think i’ll ever stop wearing makeup or using lotion, tho i may use healthier stuff. i just cant bring myself to throw away all the stuff i have already since i dont have a job and all, and it seems wrong somehow to throw all this expensive stuff away. may change from using it once it’s gone, but that may take a while. i did buy some "organic" mascara, only to find out that only 14% of the ingredients are organic, so it seems to be kind of a sham. Memandang penyakit bukan dari gejalanya tetapi secara holistic hingga ke akar penyebabnya pada tingkat sel. Buku ini memberikan pengetahuan yang akan membuka mata sekaligus meningkatkan kesadaran bagaimana banyak hal baik itu di dalam diri, kebiasaan, maupun dari lingkungan yang ternyata memberi dampak buruk terhadap kesehatan. good book ,it gives us a choice on how to live a healthy life . I loved this book. It points out exactly why so many people are getting sick and why their excuses aren't working anymore. It shows that you can't just blame sickness on your genes so you can live an unhealthy life. If you aren't ready to take responsibility for the decisions you make regarding your health, you may not like this book. Otherwise I would definitely recommend it. It's very interesting, although not well referenced. I have read enough books on health that the information he shares resonates with other things that I've read which are well referenced. I think if someone is interested enough in restoring or improving their health - his recommendations have validity. It's an ok book, but it could have been written in 200 pages instead of 343. Some of the information is a bit repetitive. I was amazed to learn that the "fresh" produce in the grocery stores is not actually "fresh" or necessarily full of the vitamins that we expect. I would recommend this book. It is fast and easy reading. My son just deleted all that I wrote but anyways I'm only on page 50 right now and it has over 300 pages but I really like what I have read so far about this guys theories on health. I don't have much time to read but I think this is an excellent book for anyone really interested in living a healthy happy life. This review has been hidden because it contains spoilers. To view it, click here. Vitamin C is not everything, also dairy is not everything, but I liked his psychoneuroimmunology stuff and also that there are many references on interesting books one could read next. Also, good point was that health is not your doctor's responsibility but yours. It was worth reading, but it definitely could be shorter and more exact in some of his guidelines. Also it was too repetitive for me. I met the author recently and was fascinated by his story and enthusiasm. This book has the potential to change and possibly even save your life. While I am aware that he is also trying to sell you supplements, he makes an incredibly convincing case for why you need them. This book explains in detail how our bodies work. Every disease we have is because our cells aren't healthy. This book teaches us what we have to do to become healthy again. Thanks Brandon for giving it to me. There are only two diseases - 1) deficiency, and 2) toxicity in our cells! Raymond Francis, DSc, MSc, RNC, is a chemist, and a graduate of MIT, and a registered nutrition consultant. Raymond is an internationally recognized leader in the field of optimal health maintenance, chairman and CEO of Beyond Health Corporation, the publisher of Beyond Health News, host and producer of the Beyo Librarian Note: There is more than one author in the Goodreads database with this name. Raymond Francis, DSc, MSc, RNC, is a chemist, and a graduate of MIT, and a registered nutrition consultant. Raymond is an internationally recognized leader in the field of optimal health maintenance, chairman and CEO of Beyond Health Corporation, the publisher of Beyond Health News, host and producer of the Beyond Health Show, author of the highly-acclaimed books, Never Be Sick Again and Never Be Fat Again and of the Pathways to Health newspaper columns. An in-demand speaker, he has addressed health conferences all over the United States, as well as in Germany, Switzerland, Greece and Egypt.